My favorite Bang Bang can be heard here. (Perhaps you’d like to listen as you read this review?) Marc Jacobs Bang Bang was released in August, and compared to the splashy debut of Bang, didn’t even merit a drum-roll, let alone a double-bang. I’ve seen no Bang Bang advertisements in magazines and the fragrance seems to be available only on the Marc Jacobs website in the U.S. — not in any major department stores. 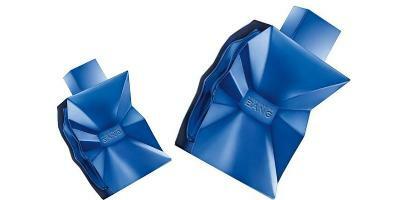 Recently, a Nordstrom perfume sales person told me original Bang was a flop with consumers. (Clerk: “It didn’t smell good. We’re not stocking Bang anymore…and there’s a new Bang?”) All this surprised me — a Nordstrom perfume counter employee dissing a fragrance? Bang, such an original, pert, fun fragrance, a dud? Bang Bang was developed by perfumer Yann Vasnier and lists notes of lemon, fennel, cardamom, sage, patchouli, sandalwood and cashmere musks. * Ignoring the advice I give others, I bought Bang Bang…unsniffed. Bang Bang is not a variation on Bang; to my nose there is no relationship between the two perfumes, apart from the names and bottles. Where Bang is sharp, pungent, “clear” and centered around pepper, Bang Bang is soft, diffuse, “fuzzy” and built around cardamom. Bang Bang starts with cardamom-y citrus; as the citrus fades a sheer cedar-sandalwood aroma appears and slowly turns milky (with a glimmer of coconut and spice —more cardamom). As the fragrance becomes “rigid” (stops developing) one is left with quiet sandalwood-cedar, tonka and sweet see-thru musk (tinged with the softest veil of incense imaginable...benzoin?) Overall, Bang Bang is linear; what you smell on skin after the first ten minutes is what you smell all day. Do I like Bang Bang as much as Bang? Noooo. My tastes run more towards the brash than the demure when it comes to fragrances, but I’m not too unhappy I bought Bang Bang (I can give it to a Bang Bang lover, use it as a room spray, or wear it on days when I want an understated perfume). Bang Bang is unisex, and has good lasting power and minimal sillage. My favorite Bang Bang is still by Dalida. Marc Jacobs Bang Bang is available in 50 and 100 ml Eau de Toilette ($55/75). *Note lists for Bang Bang go from super-simple to complex depending on the source of the information; the Marc Jacobs website lists only lemon, sandalwood and musk. I actually own and like the original Bang, there was some kind of trend last year with spiced/pepper fragrances… Loewe 7, for example I ended up giving to my dad ’cause he loved the smell and I bought the Bang as it has a slightly longer lasting. Now that I recall, a few CDG also follow this trend, Wood ? EaudeMale: yes, pepper is out there these days, but usually PINK…I like good ole black pepper best I think…. Kevin, I love Dalida’s Bang Bang… to bad MJ’s Bang Bang isn’t as wonderful. Is MJ’s Bang going to be discontinued? Tara: I hope not! But certainly Nordstrom isn’t pleased with it! Marc Jacob’s version sounds pretty nice, though. I haven’t seen Kill Bill, but if this song’s in it, I just might need to. Angie: Baby, shot her down, yes…but he didn’t mess up Nancy’s pink boots! Wasn’t their a reggae style song called “Bang Bang” which was featured on an episode or the Wire, about shootings which went on all night? Kevin a huge thank you for the link to the Dalida song. I own at least 5 cd’s by her, but had never heard of this one. I have never smelled either Bang or BangBang but listening to the music was a delight! This is my favourite version by Dalida. The song seems to inspire more comments than the scent. Honestly, this sounds like it might work for women – what do you think? The notes sound promising for warmer weather. KRL: it could certainly work for women and be a nice warm weather scent too. Only someone who wasn’t living in France in the ’60s could like Dalida. Aaaargh! She was dreadful. Bela: HA! First it was Deneuve, now Dalida…your hatred of divas knows no bounds! *I got to France in the 90s…that explains it all perhaps! LOL! There are lots of others I dislike (male and female divas), *but* I love lots too: Barbara, Piaf, Serge Reggiani, Simone Signoret, Mouloudji, Philippe Noiret… masses of wonderful, talented people. I think it explains everything. You also need to be a native re. the language. Why do you think some artistes (not artists) become more famous abroad than in their own countries? It’s because foreigners can’t ‘hear’ what they sound like to native ears. B: we can agree on Signoret if no one else! I like the original Bang! too. The two-banger sounds nice, but as you say – not as fun. hAUNANI: Bang Bang is SHY compared to Bang. MultiD: no X-rated links here! HA! Eek! I must be getting old! The only version of Bang Bang with which I’m familiar was done by Cher! Strangely, but for me both Bang and Bang Bang share the same aura. They are peppery (dusty) woody fragrances, but Bang is simply pepper pepper + woods, when Bang Bang is richer in the point of spices. Kevin – I’ve not tried Bang, but this Bang Bang sounds like something I’d like to sniff. I like the use of cardomum in Fifi Chachnil to kind of zing up a basic Shalimar like composition. Perhaps people didn’t like the original Bang b/c of the marketing? It was kind of too much of a good thing. Hm. I suppose I’m surprised Bang was a flop for Nordstrom. Next they’ll be telling us the boring Chanel Bleu has been a runaway sales hit. I liked the black pepper in Bang, but it seemed to be a pretty short-lived scent. Maybe I just didn’t spray enough on. I do like to spray. Cardamom doesn’t sound too bad, and lemony-cedary-sandalwood doesn’t sound that bad either, but I suspect I can do better than dropping $55 on a small bottle of Bang Bang. And… blue? I guess maybe young guys like to buy blue stuff. Joe: YES…after telling me Bang was out of stock…permanently…I was told Chanel Bleu was “sensational.” Oh well! Don’t faint but I’m betting I love to spray more than you…a good twenty sprays of Bang makes it last all day…and it’s still not obnoxious. I’ve only gotten compliments when I wear it. The front and back of the B.B . bottle is blue metal…the images online make it look matte and plastic…not the case.